Can't keep the lights bright with your stock 45 - 60 amp alternator? Now you can have a 75 amp factory style replacement for your 1970 - 1983 Chrysler, Dodge, and Plymouth vehicles. 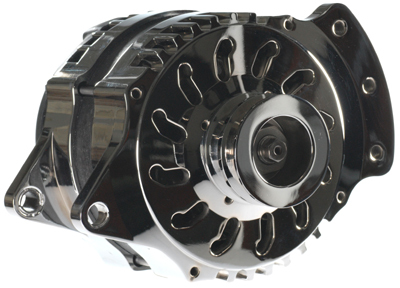 Our high output alternator will produce almost the same power at idle as your stock alternator did at max RPM. We will set them up for "single field" or "dual field", just specify your vehicle's year when ordering. 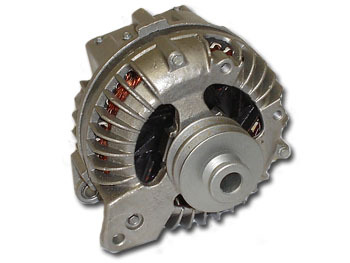 Our high output alternators will work with the existing factory regulators and are supplied with a double V belt pulley. NEW!! CLICK HERE to see our High Output / High Amp 1-Wire replacements for your 1960 - 1983 Chrysler, Dodge, or Plymouth. (see picture below) These are a custom made alternator with a billet aluminum case and will be a direct bolt-in fit for your factory alternator. They are available in 150, 200, 250, and 320 amp versions.